Located on the outskirts of Milton Keynes – and just 5 minutes from the M1, 1 minute from the A5 or a short rail trip from central London – Abbey Hill’s beautiful countryside views make it a great location for meetings and events. Whether you are looking for an intimate boardroom meeting or a larger corporate event, Abbey Hill offers the perfect space for you and your delegates. With a capacity of up to 150 delegates for conferences and with the added benefits of free parking, golf or a fun round of Adventure Golf; our friendly and experienced team will adapt your meeting to ensure you and your delegates experience an enjoyable time at Abbey Hill whilst covering all your business objectives. 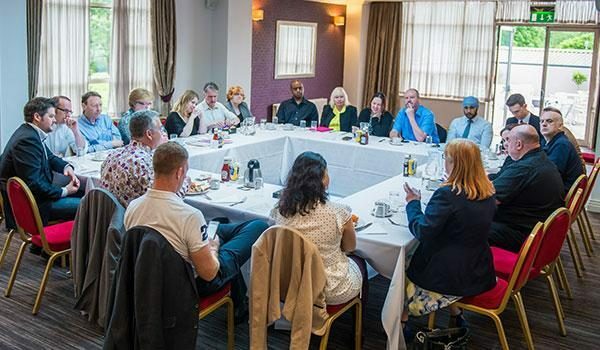 Why not call our meetings experts on 01908 562 566 to find out more or book a meeting? Our Fairway Suite has beautiful feature windows with panoramic views over the golf course, making it feel light and spacious. Overlooking our patio area with a private bar, it caters for up to 150 reception style. The room has a split wall partition, making the space flexible to suit smaller numbers of guests. Our standard day delegate rate is great value for money. Call us today to book your meeting on 01908 562 566.